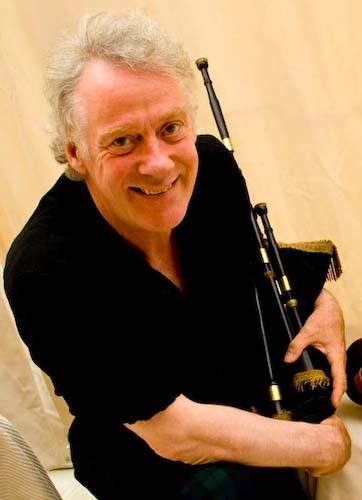 Born in 1951, Gordon grew up in Edinburgh, Scotland and started learning bagpipes in 1958 with Hance Gates who was a Pipe Major of Edinburgh City Police. After playing in Boys Brigade and Royal High School pipebands he went on to study Town Planning at Dundee Art School. While working in Edinburgh in 1975 he was drawn to the folk revival scene and at the Linlithgow Folk Club he met Jimmy Anderson of the Clutha and Rab Wallace of the Whistlebinkies who were also members of the world champions Muirhead & Sons Pipe Band. Encouraged to join the band, Gordon spent a year in intense tuition with Pipe Sergeant Davy Hutton. After Muirheads disbanded, Gordon played with Kinneil Colliery pipeband and was for several years Town Piper of Linlithgow. During the late 1970's he began researching Lowland piping music and instruments and took up the Northumbrian smallpipes. In 1981 with Mike Rowan he formed the Lowland and Border Pipers Society and through contact with Northumbrian pipemaker Colin Ross brought about the revival in playing and making of Scottish Smallpipes and Border pipes. The revival has been a world wide phenomenon giving work to many full time pipe makers and pleasure to thousands of players and lovers of Scottish music. Gordon gave Hamish Moore copies of the tunes he had researched and which Hamish used on his album 'Cauld Wind'. In 1983/4 Gordon published his collections of music for the Lowland and Border Bagpipes and a Tutor for the instruments in 1985. In 1989 he produced the ground breaking and acclaimed album "O'er the Border" described as 'Bordering on the sublime” by the Scotsman. His tutor for Northumbrian smallpipes was Joe Hutton, an inspiration to Gordon and so many others. Gordon's expressive and innovative playing has taken him to perform in Europe, North America and throughout the UK with the band O'er the Border and with his famous fiddle playing daughter Shona and as a duo with harpist and whistle player, Nancy Lyon. Gordon has a deep knowledge of Scotland, having lived for 10 years in Linlithgow, 18 years in the Scottish Borders and 9 years in the Scottish Highlands based in Inverness. Now retired from a career in Town Planning and Building Conservation in Edinburgh, London & SE, Northumberland and the Scottish Highlands he lives in Quebec and continues to perform, teach and make instruments.